Rosario (Agenzia Fides) - The parish of María Reina, in the town of Rosario and the school just near the church, were the target of more than ten shots at dawn on Sunday, 23 September, around 4 am. As Fides learns, it is a clear intimidating message, easy to connect to the appeal that the local priest Don Juan Pablo Núñez, had launched in recent weeks, denouncing the extreme violence suffered by the inhabitants of Barrio Larrea, because of the presence of crime linked to drug traffickers. The parish priest, who has been working in the area for four and a half years, had already warned the authorities of the terrible situation of drug trade that takes place in the streets of the neighborhood. In recent weeks, the priest had launched an appeal through mass media: apparently, the criminal group did not like the complaints and exposure of the priest. A month ago, Father Núñez had approached the Ministry of Security authorities, requesting prompt intervention. On Sunday, September 23, the parish priest also celebrated mass in front of the faithful, surprised and shocked at the sight of some bullets on the altar. 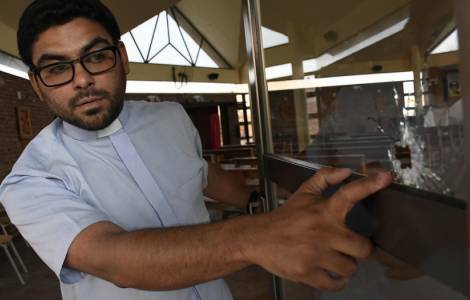 "The impact of the bullets on the large entrance door is very visible, but some bullets hit the altar directly", said the priest. After being appointed parish priest, don Juan Pablo Núñez opened a recovery center for young people with drug problems and was threatened several times. Following numerous intimidating acts, he had to close the center because the youngsters were afraid or threatened by the narcos. The parish priest had shared the idea of reopening the center with the faithful to try again to "save young people from this scourge" but, as sources of Fides report, perhaps the rumors reached criminal groups linked to the drug trafficking in the area. Hence the new violent warnings against the Church.